In the past year or so, beer gardens have been popping up all over Philly. Heck, we even have traveling ones! And if you're a Philly Happy Hour regular, you already know that Drury Beer Garden is one of the OGs. Located in the back of Opa, it offers a relaxed environment where you can post up at the bar or have some drinks while playing ping pong. All the while, you're able to enjoy the tasty Mediterranean offerings from Chef Bobby Saritsoglou. Owners George and Vasiliki Tsiouris were right to bring him on a few years back. Chef Bobby's an awesome dude with an amazing personality (check out that stache!). Even more impressive is his dedication to his craft, making pretty much everything in house. As such, the GF and I were excited to stop by to try his new Drury Beer Garden menu. We started off with some summery drinks. The Twisted Tea was obviously an easy drinker - essentially a spiked Arnold Palmer. Drury Beer Garden's also got specialty cocktails pretty much on tap, along with a rotating slushie! We opted to try the mango tango, which was fruity, sweet, and hit all those seasonal notes. PEI's were plump, meaty, and immersed with a light, garlicky broth that was perfect to sop up with the grilled bread. The pita flatbread was housemade (of course!) and crisp, with a bright depth coming from the harissa paste. It was topped with seasoned ground beef and red onion. 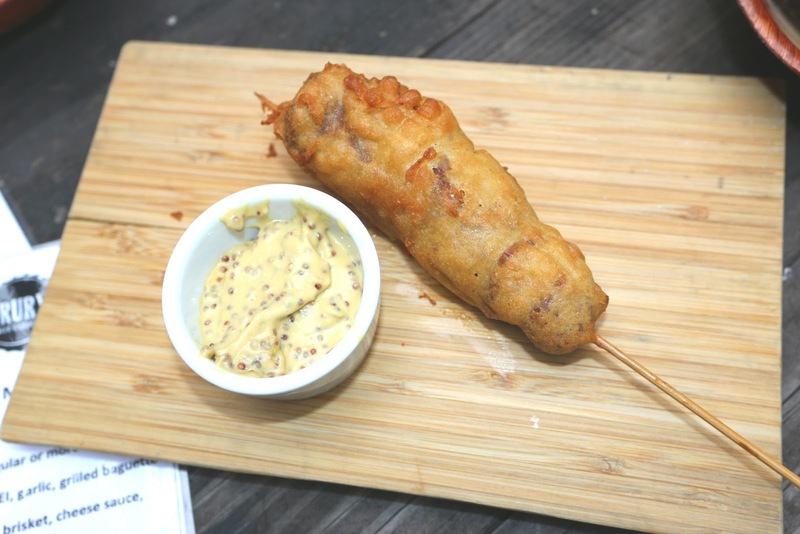 I was a big fan of the corn dog, which was deftly fried and had a wonderfully spiced sausage within. Hefty in its own right, you can also opt to go Moroccan style, topped with sauce and cheese! The loaded fries are a must. 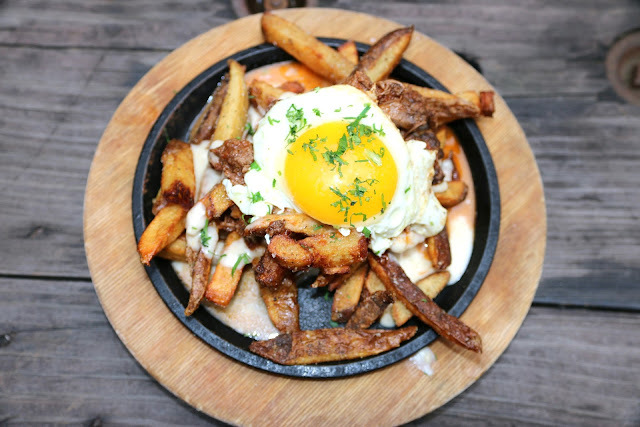 Crisp fries are well-seasoned, with a cheese sauce dripping between the spuds and a fried egg ready to ooze its yolky goodness. 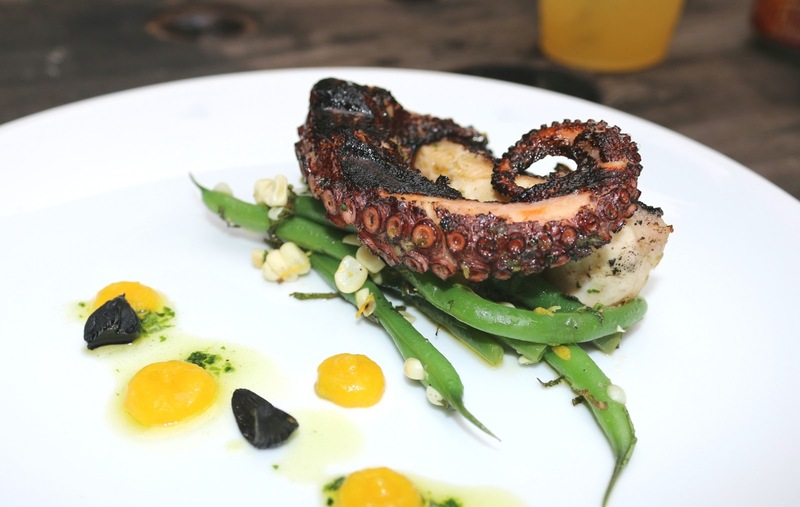 Chef Bobby also sent out the octopus, which was a stunner. Hours go into the prep, which resulted in an incredibly tender cephalopod. It's then charcoal-grilled to provide savoriness that was amped up by the accompanying black garlic chips. 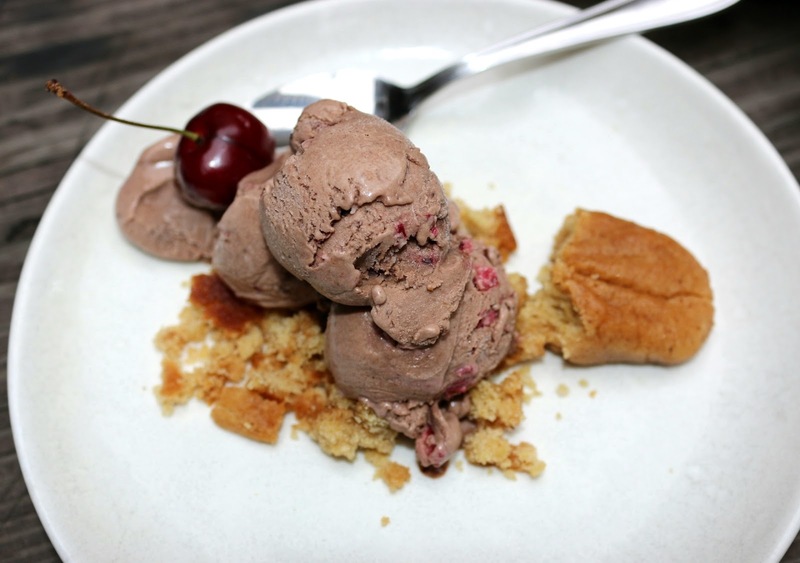 If you need to satiate your sweet tooth, do try the housemade ice creams, which were paired with a spiced shortbread. The cherry chocolate was light, subtly sweet, and easily enjoyable. 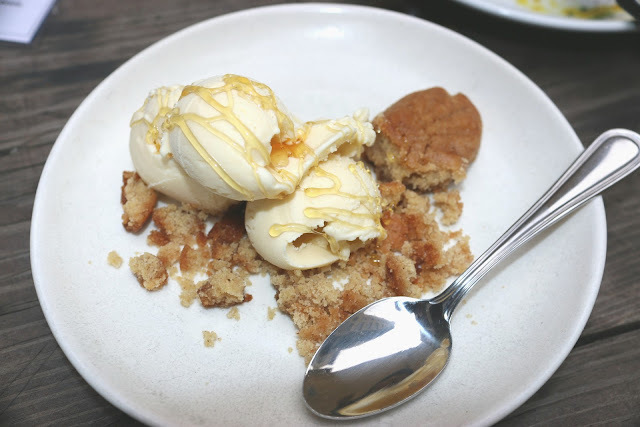 The honey vanilla was deceptively simple, but reminded me that sometimes all a good dish needs to shine are quality ingredients. The clean, sweet flavors helped to provide the perfect bite to end our Drury Beer Garden experience. So if you're never been, be sure to stop by before summer lets out! 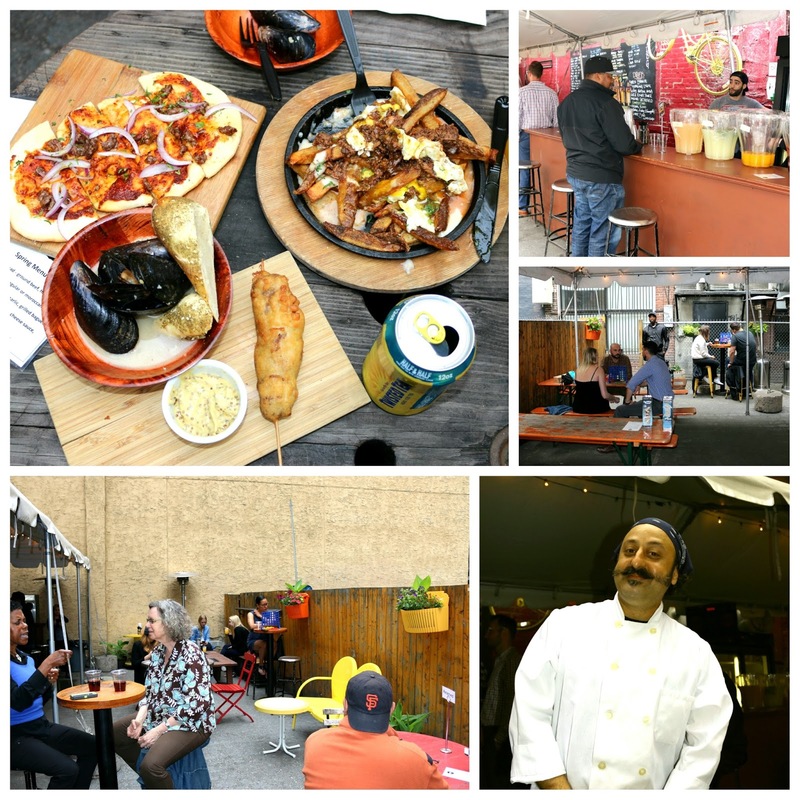 And you'd be remiss not to stop by Opa itself to check out all that Chef Bobby has to offer. FTC Disclaimer: I was invited as a guest of Opa-Drury Beer Garden and Bondfire Media. Regardless, my opinions are mine alone and, therefore, unbiased. Wasn't this the place that was closed for weeks due to failing inspections, bugs and rodents? Eek!